A couple of days ago, just READING about something had me in a mini panic attack. The I’ll never, as long as I live, call it the Willis Tower, ever, ever, ever Sears Tower has already begun some, renovations, shall we say, that will be completed in June. They are taking out four windows on the 103rd floor in order to install glass-bottomed skydecks, so certifiably insane adventurous people (and, obviously, non acrophobes) can feel like they’re “walking on air” over the city. The attraction will be called The Ledge. A ledge is what folks normally talk others OFF OF, so I find myself wondering if the creators of this “attraction” have a sick sense of humor or what. Oh yeah, and The Ledge has to be retractable, so the window washing apparatus can get by it. Doesn’t exactly add confidence in my mind. Read the entire Chicago Sun-Times article about it here. And share your thoughts in the comment box, please! For the record, I thought that the Grand Canyon Skywalk sounded really cool when they did it…but would I do it myself? Uh, no. And also for the record? I would not pay to do this. Surprised? I’m not crazy about getting on a tall ladder. Though I was fine on the actual 103rd floor during our last visit to the Sears Tower, I would not like to feel like I’m walking on air OUTSIDE the 103rd floor. No spank you. So no chance of dragging you there when I am visiting LOL? It does look pretty scary. Wondering if I would do it. Hope all is well with you. Miss you. Will be home soon. 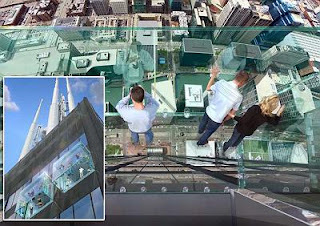 No need to book me a tour to the Sears Tower RETRACTABLE glass floor in July. Yikes! Glass elevators I can handle, glass floors, not so much! Are our lives so boring we need to go out on The Ledge? Not me, no way! Climbing up anywhere is a challenge for me. Terra firma for me. No ledges, on skyscrapers, mountains or anywhere else. no way. not in this lifetime. i’m ascared o’heights. well…kinda. i’ll stand on the ground and look up. it’s much safer that way. There’s a bridge that I walk over on my lunch break. It crosses the Mississippi river. I can’t even walk near the railing because of my fear of heights. This new thing on the Sears Tower? No way. Never, ever, not in a million years. No thank you. Maybe I would stand across the room and look at it… There is absolutely no way I would stepping foot in/on that! That is terrifying just looking at the picture!!!!! I just cannot fathom why anyone would even consider that, it is so very very wrong. Did I mention I am afraid of heights too? If it is more than one story up I am not wanting to look down. And when they took me to Noah’s Ark in Wisconsin Dells the worst ride ever was the one you go over this horrid moving plank bridge thing, that scared the crap outta me! I will end my rant and take some soothing breaths now, lol. I don’t have a fear of heights. I have a fear of edges. Kat: All that stood out of your comment to me (with a big bright light around it) was “when I am visiting”. My goodness, if that ever happens I might need medication to deal with my giddiness. BUT then I read the rest of your comment and yeah, I’d go up to the 103rd floor with you; I’d just stay on the other side of the room where I would not be in danger of falling out of the building and splatting in a million pieces on the ground farrrrrrrrrr below. Surprised Mom: Same here too!! Karen: I’d be with you, across the room. Nukedad: PERFECT summary. I love that! I agree with you – there is no way I’ll ever call it Willis Tower. Are you kidding me? Are people going to pay to do that? I did the Grand Canyon skywalk two years ago. It was actually quite scary. And I got a little dizzy. But I’d do it again. Cause I’m just that kind of gal. So ummm let’s see. Oh yeah. You’re totally me. A) Sears Tower will always be the Sears Tower. Ditto with the Horizon, The World, Comiskey, etc. Next post: Now THIS Is A "Fear" I Can Definitely Conquer. Previous post: THIS, People, Is Why The Internet Exists!